This handy but useful land capital gains tax calculator will show how much capital gains tax you need to pay when you sell your investment lands after certain years. "Land appreciates, buildings depreciate" is an old saying in real estate, meaning that while land goes up in value over time, the buildings on it lose value. This might be the reason that some Australian investors invest in "pre-development" or "raw" land as part of their portfolios although the investment potential of land is often ignored by most of us. This free land capital gains tax calculator is built to estimate capital gain, capital gains tax, and profit & loss of your land investment. 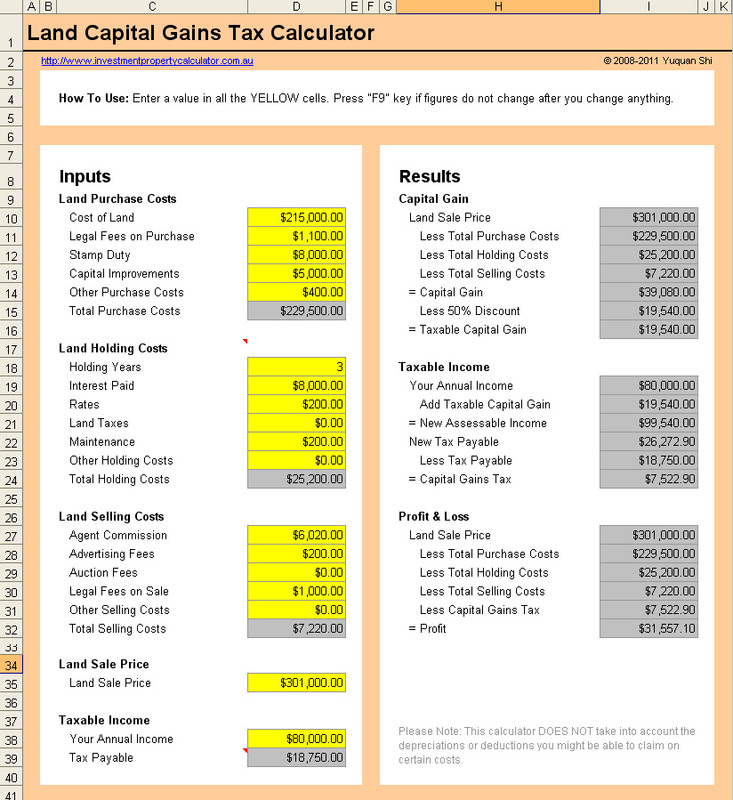 Here is a screen shot that will give you a better idea that what you need to do and how this free land capital gains tax calculator may help you. According to Money Magazine, investing in land can be worthwhile in the longer-term, but a big drawback is that it rarely provides any sort of income while you hold it. And so you cannot claim the deductions you could with a rental property, such as interest on borrowings, depreciation and maintenance although it is possible to make windfall gains by buying broadacre or rural land that is later rezoned to allow building. You might want to check out the Free Investment Property Calculator as it has helped lots of property investors. Download FREE Land Capital Gains Tax Calculator Now!